Metal structures like these goblets here can trap light. Since the goblets are very smooth, it is not hard to imagine the light going round and round inside, forming electromagnetic modes. The objective of our research is to modulate light in vibrating goblets. If the goblets are very small, with sub-micron radius, then we call the electromagnetic modes 'plasmons', or, more specifically Mie-like plasmons, after the German scientist Gustav Mie. Our sample is a close-packed array of tiny golden goblets, forming a plasmonic crystal. A section of the sample is shown here together with an electron microscope image. 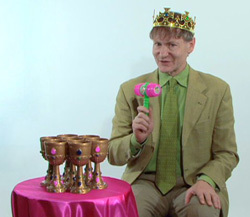 Each goblet is a truncated nanovoid. These intersect a bit, giving an interconnected structure marked by triangular pillars. Sample: gold nanovoid array and electron microscope image. In the experiment, red laser light pulses create tiny vibrations by heating a small sub-micron spot. Our sample is in fact also a phononic crystal. Blue light pulses detect the vibrations through intensity changes at the same point. These are very-high-pitched vibrations, around 1 GHz (=109 cycles/s). We scan the sample position and change the timing of the laser pulses to make movies. Here is an example for a 6-micron-square area. The intensity fluctuations are caused by the structure flexing. We process the data to extract the vibrational frequencies one by one. Here you can see them very strongly at the centre of the nanovoids at 3 different vibrational resonance frequencies. 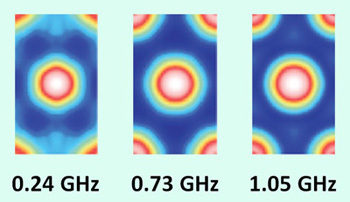 Frequency-filtered images of the vibrations around a single nanovoid. To animate, click the image (620 kb movie). To understand these data, let's look at an acoustic simulation when we excite the centre of a nanovoid. Cross section of a vibrating nanovoid at 1.05 GHz. To animate, click the image (130 kb movie). It's just like a golden goblet opening and closing. This breathing motion changes the nanovoid plasmonic resonances, and enhances the observed signals we detect from the void centre. So we can map vibrations in a plasmonic-phononic crystal. If you think that's a mouthful, you can say 'plasphonic' crystal. Engineering both the plasmonic and phononic properties of our plasphonic crystal to enhance the optomechanical interactions could open up the possibility for novel devices such as high-frequency acousto-optic modulators. 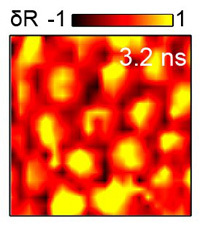 See 'Mapping gigahertz vibrations in a plasmonic-phononic crystal,' T. A. Kelf et al., New J. Phys. 15, 023013, 2013.